I'm thrilled with how they turned out! Then lightly sanded everything with a sanding block. grease or residue. Wiped clean and dried. Then we get to the fun part...gel stain! You brush it on with a foam brush, a roller or even a cloth. And yay me, I remembered to wear gloves this time. Read about how I used gel stain over white furniture. I'm actually using the rest of the quart I bought for that previous project. The product goes far, you don't need much. I used General Finishes brand and the color I used is "Java". since it wasn't available locally. After you apply it with a brush or roller, you immediately wipe off with a soft cloth. I don't have a picture of the wiping part because I was, um, wiping. I wipe once then leave it, you can always touch up later. If you mess up, you can quickly go back over with more gel stain, then RE-wipe. The thing to remember when using gel stain like this is that you aren't really "staining". This is more of a topcoat application where you are basically using it to change the color. it's not like the traditional way you think of staining. #1...it's really easy to work with since it's so thick, like the consistency of pudding. #2...You can still see the grain of the wood. You can lose that sometimes when you use paint. I left them to dry in my air conditioned garage and they were dry to the touch after about 6 hours. Minwax Satin Polycrylic with a foam brush the next morning. I found at Hobby Lobby. They are some kind of bone, or maybe resin, but I love 'em. So yeah... Did I mention I'm loving my cabinets? That's it until next time...thanks for being here! or visit my Etsy store to check out the new items. Way cool on the blog post!! are you doing affiliate with Carol Tuttle? cabinets looks great,, i've never used gel stain before.. but would love to try it. They turned out great! I have golden oak in the bathrooms and kitchen and I hate them. The gel stain sounds like it might be a great option for me. 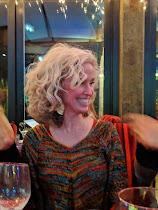 your blog and photos even impressed my husband! Thanks so much. I now have the go ahead with my baths and kitchen. Yipee! Good thing I like to stain. Cabinets look great! I am dying to give my kitchen cabinets a makeover! I might try this...it looks super easy. Why do you think they dried so fast compared to the bedroom set? If I have honey oak cabinets in my kitchen, can I apply this to then with a cleaning and light sanding? did you sand in between your poly top coats? How many top coats did you use? In the picture on your blog it looks like there were bubbles in the top coat finish during application but not in the final pictures. I really like those knobs! Those are pretty cabinets. I like the idea of painting them with chocolate brown color. It was a good move for you to renovate your cabinets giving your kitchen a new look. By the way, I like the knobs that you used on those cabinets. Their designs complement well with the designs of your cabinets. I don't know if you used screws to adhere those knobs but it would be a better idea to use screws to make it sturdier and stronger. Thank you very much for this information, you just gave my wife and I the information we were waiting for, I can't wait for the weekend to start this project!!! I think i'm going to try stain mine this summer. :) Thanks for the post! No, LOL, I did not stain the insides of the cabinets :). Your did a wonderful job. I have recently seen where a gentleman used a paint brush, didn't wipe anything off, and ended up doing two coats. He came out with the same results. I guess I'm not sure why anyone would need to wipe it off if it's a top coat anyway!? Have you ever tried just painting it on and letting it dry? Thanks for posting your project! Hi Chris! I'm sure you could brush it on and not wipe, it would give a more solid appearance in the end result. I wanted a little of the background color to show through to give it a little more of a wood look and not have just the smooth, solid color. Just wondering how many coats you used on these cabinets and how long you let them dry between coats? Hoping I am brave enough to try this! what about the closet doors, trim boards, and the bathroom door? Are/were they also the traditional oak color, and if so, did you stain and change them all as well or just leave as is? Just wondering, could you do this on white painted cabinets by just sanding first? 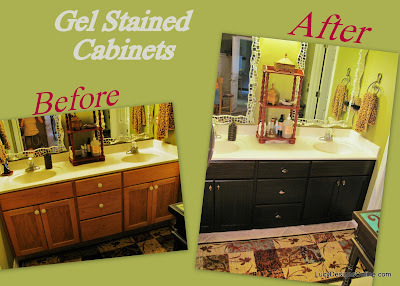 hmmmm...I have used gel stain before to change color of cabinets and did not think to wipe off. They came out nice but not as nice as these. Great job.